Sydney Shop Girl: Daylight Saving Begins. Work Shorts On A Short(ish) Work Day. Daylight Saving Begins. Work Shorts On A Short(ish) Work Day. It's daylight saving time again and the first few weeks are always the hardest. I was just getting used to waking up with a little sunshine to accompany me on that little metabolism booster I like to call my morning jog. Now I'm back to those less than inspiring dark skies in the morning. The upside is that coming home from work in broad daylight makes me feel that I have an extra hour or two before bedtime up my sleeve. One way to ease into dark mornings is with the aid of Australia Post's 7.30 am parcel delivery in our suburb. Nothing like a pair of white jeans to light up the morning. 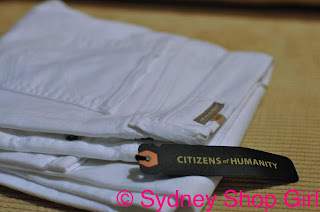 These are those COH Phantom's that I ordered off Revolve last week. All hail the AUD. I was a bit nervous trying them on - being white and skinny (the jeans, not me) but they actually looked perfectly presentable on. Good weight in the denim, no transparency issues and a very flattering cut for the hippier and not so leggy person. Right, spring/summer 2010 - bring it on. I'm all set to enjoy your glorious weekends. Work wise, there is light at the end of the tunnel of busyness I have created for myself. There was a black out at 4pm - computers, overhead lights all gone. It was liberating leaving work early. I have to work all Saturday but next weekend - I'm off to Melbourne again. Work and catching up with friends old and new. I think it's officially work shorts season, don't you? I don't know what else to call them. I threw the swing tag away before reading it. 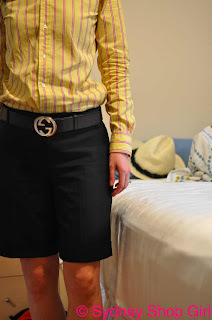 Banker's stripe shirt - Ralph Lauren (see post from Tokyo about Mastuya Ginza), work shorts - Ralph Lauren (ditto), belt - Gucci (got the cobbler to put in an extra hole to convert it from hip to waist belt, a steal at $2 for an excellent job). This is what I wore to work today. I call it my tribute to the trials of the Banks of Australia. A symbol of solidarity with my good friend Mr Norris and the dilemma about what to do with Which Bank's interest rates now that there has been no rise in official interest rates for this month. Plus the excitement of the AUD reaching a 27 year high against the greenback. And let's not forget the excitement about tomorrow's IMF meeting and the expected good verdict on the Australian economy. Sorry, still getting used to the new tripod for my camera. It's nice and solid but tricky to manipulate. I keep chopping bits off my photos. Here's the shirt collar. Blanche, a regular reader and commenter on my blog (thank you!!) had a question about how I was finding Kiehl's Midnight Recovery Complex. My contraband hair clip from Cabramatta had its first outing today as well. I've been using it for a few weeks now and have nothing but good things to say about it. It has a wonderfully ... botanical (to quote the midnight blue bottle) fragrance. The oil itself is light and absorbs rapidly into my skin. Rosehip oil is heavier in comparison, I find. I tend to apply it all over my face (not sure if you're meant to avoid around your eyes) and then use an eye cream on top. If my skin is really dry, I use a face cream as well. I have dry skin that is a little sensitive. I haven't had any breakouts or reactions from this product. It's $95 and a little goes a long way. I hope this helps and if there are any other questions about things featured on the blog, leave a comment and I'll get back to you. I'm off to read my Cathy Kelly novel and open those new magazines that arrived in the post today. I like those shorts but my workplace is very conservative so I'd don't think I'd get away with them. I wish our Parcel Post came at 7:30! Very interesting blog.I like these type of blogs where you get to know of yourself.Just find it very entertaining. Thanks for the follow up! I might have to give Kiehls a visit to see if they have any samples. Your skin must love the rosehip oil....I love any rose oil and Dr. Hauschka does a great one which I use liberally....as to the skinny white jeans...love them, can we see them on and what are you pairing them with? 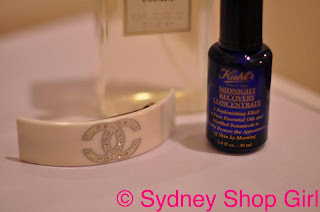 How I enjoy reading the musings of Sydney Shop Girl!